It wasn’t named until an 11 year-old girl suggested calling it “Pluto,” after the mythological Roman god of the underworld. At that time, Pluto had the title of being the furthest object ever found that rotated around the sun. It was our solar system’s outermost planet, the deep dark member of Earth’s immediate family. 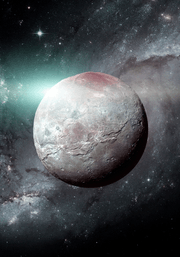 For decades, scientists, astronomers and students learned about the lonely planet Pluto. Then, in 1979, Pluto got its first humiliation. Because the orbits of planets are not perfect, Neptune swung further out in the sky, making Pluto only the “second” furthest. It lost its title. Things got worse for Pluto in 2006. At that time, the astronomers who oversee how objects in space are classified reviewed their rules. Under their new rules, Pluto was too small to be a planet. It was removed from the official list of solar system planets. Pluto was just another “mass” whirling through space. But Pluto has fans. Many scientists who grew up looking at Pluto as the great distant planet were upset. They thought that Pluto’s history should give it special consideration. Because of their concern, the International Astronomical Union sat down and again looked at how they defined a planet. Many hoped that a new definition would return Pluto to its previous glory. After all, it had moons and was a significant body at the very edge of our solar system. Still, Pluto is smaller than our moon and has very , very weak gravity. The astronomers sat down and played with their numbers. Over the last few months, they created a new definition of what makes a body in space “a planet.” This new definition would again make Pluto one of the planets in our solar system. If any object in space could be considered an underdog, it would be this small, lonely body over 3 and a half billion miles from the sun and so very far away from our own world. « Are you a Cyberbystander?